Hiya folks! Thought I'd pop in to post another old custom. 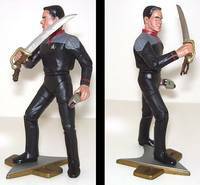 This time around, it's the first and only Star Trek figure I've ever produced. Introducing the legendary Warlord of Xenex, bane of the Danteri, and maverick captain of the Starship Excalibur, M'k'n'zy of Calhoun! Peter David is one of my favorite writers. He's extremely prolific, with his hands in film, television, comics, and novels. Most people on this site will likely know him for his comic book work, having helmed some of the most famous story arcs in modern comics (Aquaman, Supergirl, Hulk, Spider-Man, Young Justice), and even having created his share of iconic characters (most notably, Spider-Man 2099). However, it is his work writing Star Trek novels that first drew my attention. Yeah, I used to be something of a crazy Trekkie (no, I never went to a convention or dressed as a Klingon), and while my fanaticism has waned in the past decade (why? Because Voyager and Enterprise, that's why. Thanks, Brannon Braga), I continue to stay connected to the universe, all thanks to Peter David's New Frontier series. New Frontier was an experiment by Peter David and John Ordover (Star Trek editor at Pocket Books) in creating a wholly original Star Trek series, independent of the TV shows, starring a largely original cast of completely new or previously minor characters as the central command crew of a new ship on a new mission. One-shot characters from The Next Generation TV series (Dr. Selar, Cmdr. Shelby, Ens. Lefler), forgotten characters from the '70s Animated Series (M'Ress, Arex), characters from previous books (Lt. Kebron, Lt. Soleta, Lt. McHenry, Lt. Tobias), and a slew of original characters, came together aboard the USS Excalibur to explore the area of space containing the fallen Thallonian Empire, all led by a former planetary warlord and liberation fighter turned Starfleet commander and special forces operative, one Mackenzie Calhoun. The series proved to be a resounding success, with 21 novela, 5 independent short stories, 2 graphic novels, and one short story anthology book, not to mention numerous mentions in other works and nearly official canon status among the core Star Trek universe. Not bad for a series almost exclusively created by one writer. But enough of the background, on to the figure! Captain Calhoun was a fairly simple creation. I just took the head off of a HML movie Colossus figure, and popped it on a Star Trek: First Contact Captain Picard body. A little sculpt to give him actual skin instead of metallic muscles and tendons, carve in a scar across his right cheek (a remnant of his days as a freedom fighter on his homeworld, he was slashed across the face with a sword . . . he proceeded to disarm his assailant, kill him with the very sword that cut him, and then stitched the wound together with a plasma welder! OUCH), and a full head-to-toe paint job, and he was pretty much done. Calhoun was sort of a paint experiment for me; being a custom from several years ago, I was still learning about proper paint texturing, and I specifically wanted Mac to have a realistic appearance. His uniform was painted with flat colors, his boots are gloss, and his skin has a mottled, life-like finish with subtle speckles and a rough surface like real bronzed skin. It looks fantastic in person, really. 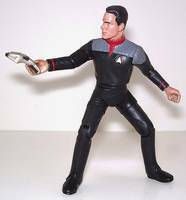 Calhoun comes with a Starfleet display stand, obviously, as well as the iconic Star Trek weapon, the hand phaser. He also comes with his sword, again the very same weapon that laid open his face, now a decorative piece hanging on the wall of his ready room (though even now, he's not above using it in a pinch . . . so boarding parties beware!). Someday, in the DISTANT future, I hope to make the entire command crew of the Excalibur. For now, I have to be content with Captain Calhoun standing guard over my bookshelf, protecting my complete set of first edition New Frontier books. Thanks for all the adventures, Mr. David! awesome custom, love peter david and if he wrote the book/stories, know they are awesome. 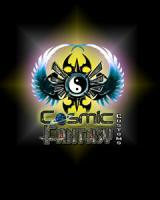 custom is great as usual and the info is greatly appreciated. can't wait to see more of the crew and other customs, always excellent. Thanks bro. Guess there's just not that many Trek fans around the Realm. Very cool rendition of the character. Thanks much! But DAMN, I didn't realize how badly the 600x600 conversion messed up his face in these pics! Fixed them now, he looks a LOT better . .. be sure to check back once they update.